One of the UK’s most prolific weight-loss surgeons has been honoured by the University of Sunderland. Kamal Mahawar is passionate about the North East and the people who live here. Besides from his birthplace of Kolkata in India, the Sunderland Royal Hospital consultant has spent more time living in the region more than any other place in the world. One of the UK’s leading bariatric surgeons, he has now been given the honorary title of Visiting Professor at the University of Sunderland. And it’s an honour close to his heart. 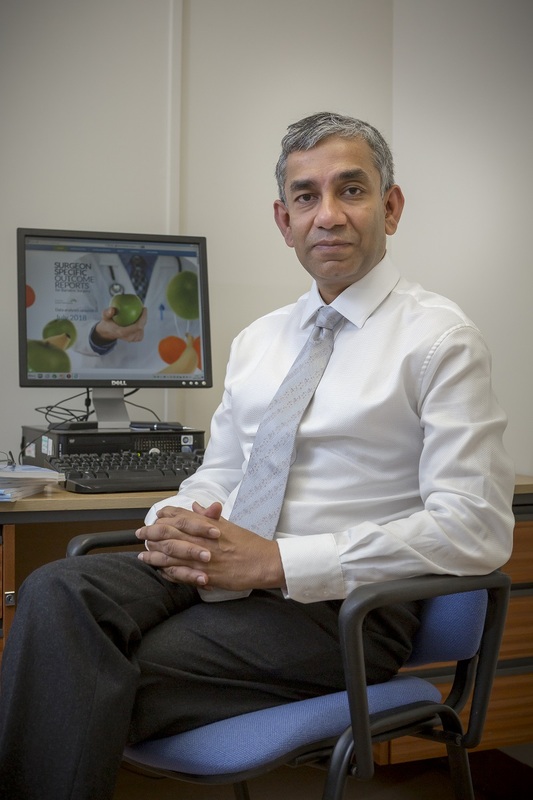 Kamal is one of six specialist consultant surgeons working at Sunderland Royal who specialise in bariatric surgery – operations which help people to control their weight. Between 400 and 600 procedures of this kind are carried out at the hospital every year, making the unit one of the most prolific in the UK. Kamal’s new title is another highlight on his already impressive CV. His work in understanding and developing One Anastomosis Gastric Bypass – a surgical procedure which makes traditional bariatric surgery quicker and more efficient – has been internationally recognised and is now setting a precedent for future weight loss operations. He has also co-authored more than 100 peer-reviewed articles and multiple book chapters. Married to wife Shalini, a software engineer, for 17 years, the couple have a 13-year-old son, Kush. They have lived in the North East since 2004. “I love it here, it is home and we feel very settled,” says Kamal. It’s a long way from the Kolkata home where Kamal grew up before attending Kolkata Medical College where he obtained his medical degree in 1996 with multiple honours and medals. He went on to obtain his Master of Surgery from the prestigious PGIMER in Chandigarh in 2000 before emigrating to the UK. In Britain, Kamal went on to receive an MSc with distinction from Liverpool University and obtained further surgical training in the Northern Deanery. Arriving as a surgical trainee at Newcastle’s Freeman Hospital in 2004, he moved to Wearside in 2008. His work on the bariatric unit has been pivotal in the development of the procedure and he remains a staunch defender of these type of operations in terms of their benefit to patients – and to the NHS as a whole. Kamal was also keen to welcome news that, from September, the University of Sunderland will open its new School of Medicine – one of only five across the country. Kamal is also a non-fiction writer. His book The Ethical Doctor, was written about the current state of Indian healthcare. His second book is currently under publication. He regularly mentors healthcare professionals from around the world on academic and research matters and he has set up multiple email chat groups with thousands of members to facilitate interactions among healthcare professionals working in the field of bariatric surgery. University of Sunderland School of Medicine: What are people saying about it?